As we inch closer and closer to the warm-weather seasons, many of us start to show symptoms of spring fever—an ailment that can only be cured with heavy doses of sunshine, fresh air, and outdoor fun. But if the low temps are still fencing you in, perhaps it’s time to consider outfitting your home with a sleek system that can keep your deck, patio, or sunporch livable, no matter the season. 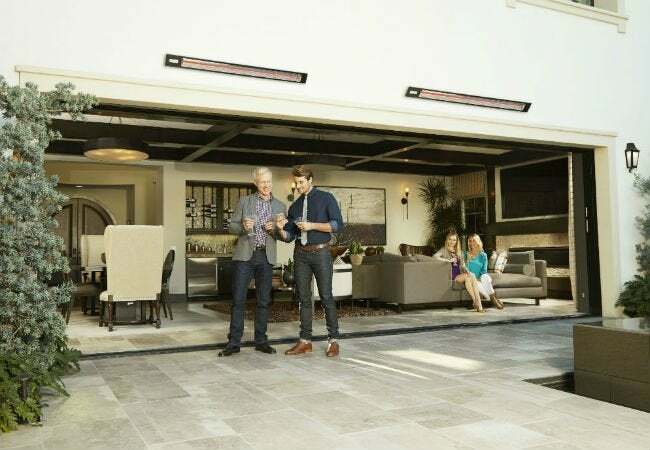 This month, we’ve partnered with Infratech to offer $5,000 (up to $3,500 in product and up to $1,500 in installation) that you can put toward energy-efficient, high-style heating systems that lend warmth and comfort to any outdoor space—at any time of the year. For over 50 years, Infratech has served as the pioneer in indoor/outdoor heaters, offering low-profile units that can suit any space and style. While sleek designs and customizable features make their products a great-looking alternative to other models on the market, their 90% energy efficiency and smart home capabilities are what truly sets Infratech solutions apart from the crowd. Crafted from the latest manufacturing technologies and offered at the lowest cost in the industry, Infratech heaters are the perfect combination of comfort and style. Outfitting your space with these top-of-the-line heaters can help make your home the spot to kick-back, relax, and enjoy the great outdoors all year round. If you’re the lucky winner of this month’s give-away, you’ll walk away with $5,000 (up to $3,500 in product and $1,500 in installation) to put toward Infratech heating systems. A typical package may include two SL-Series Slimline heaters, a control panel, and installation, but you can work with Infratech’s experts to determine the perfect product package for your home. So what are you waiting for? Enter today and every day in March for your chance to win one of these versatile, stylish, and energy-efficient products for your home. To learn more about Infratech, click here. 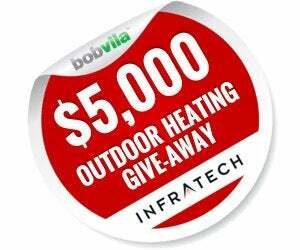 The “Bob Vila’s $5,000 Outdoor Heating Give-Away with Infratech” is open only to permanent legal U.S. residents of the 50 states and the District of Columbia. Void in all other geographic locations. No purchase necessary. Void where prohibited. Contest Period runs from 12:00 p.m. (EST) Monday, February 29th, 2016, through 11:59 a.m. Thursday, March 31st, 2016. One entry per household per day on BobVila.com. Alternative means of entry for Drawing is available by faxing your name and address to 508-437-8486 during the applicable Entry Period. Odds of winning depend on the number of eligible entries received. See Official Rules.